After roughly 36 years of existence, you’d think that the Mario franchise would be on the decline or that audiences would have felt franchise fatigue. Through either the magic of marketing or Nintendo’s pure genius designers, Mario remains just as relevant today as he did back at his inception. Super Mario Odyssey is a strong testament to not only Nintendo’s seal of quality, but to the company’s ability to craft a delightfully goofy, charismatic and (above all else) fun adventure. The story of Odyssey isn’t a grand departure from the narrative of past Mario titles. Bowser has captured Princess Peach in an attempt to marry her and is traveling around the globe to collect items to hold the perfect wedding. After narrowly being defeated, Mario stumbles upon Cappy, one of an unnamed race of hat-like creatures that happened to have his sister, Tiara, stolen by Bowser alongside Peach. Cappy then transforms into Mario’s hat and the adventure begins. One of the best qualities of the original Super Mario Bros. was how it taught players without using dialogue or tutorials. You learned by doing and tinkering with each button to see what Mario would do. While gaming has obviously become far more complicated than a two button controller, Odyssey manages to retain a lot of that design philosophy for its various challenges. Cappy has the power to control other creatures, but the game doesn’t explicitly tell you that. Cappy just asks you to give him a toss at something and then the game shifts into an oddly dark transformation cutscene where Mario becomes a frog. Without wasting any time, the game then gives you full control of this frog and lets you figure out the rest. Seeing as how every transformation utilizes the same buttons as Mario, a player’s natural ability to hit jump will lead them to figuring out how the frog jumps and a simple on-screen display writes out other controls without stopping the flow of gameplay. This same rule applies to the level design, as well. Nintendo is masterful at showing, not telling, so when you encounter any kind of new challenge, usually something in the background will show you what to do or the game will throw you head first into the challenge with subtle cues on how to surmount it. It is very much in the vein of how classic Super Mario levels work. The actual size and direction of each level is more like Super Mario 64, though. 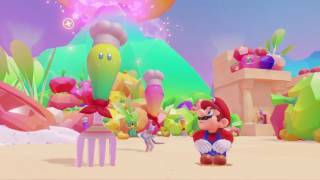 Odyssey marks a return to Mario’s first foray into three dimensions with a pseudo-open world structure. Where Super Mario Galaxy, for instance, basically copied the 2D games’ bite sized platform sections, Odyssey sees Nintendo blowing up each level and letting players have at it in whatever order they see fit. 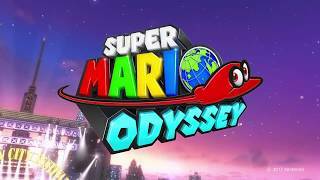 Some main objectives exist and you can breeze through the actual story in relatively short order, but the true fun in Odyssey comes from the sense of exploration that is readily available in each area. It almost gives Zelda a run for its money with world design, though each section isn’t seamlessly connected. These levels are littered with power moons, the new collectible that replaces stars from the previous 3D Mario games. Where older titles had a hard cap of 120 stars (Galaxy 2 being an outlier with 242), Super Mario Odyssey explodes that number into the literal hundreds. Some levels will have 30 moons and later ones will feature 101. Each area isn’t consistent in amount, but a quick run through won’t even uncover 20% of what you can collect. While a good portion of the moons offer some degree of puzzle solving or skill challenge, a bunch are kind of rote. Things like “ground pound this spot” or “talk to this guy” needlessly bloat out the number you can collect, but getting as many moons as possible leads to the end game goal of unlocking extra content, something that most modern games tend to overlook. It’s a joy to finish the main campaign in Odyssey, unlock a real nostalgia throwback level and be told there are even more challenges in previous areas. This might be a drag if each area looked the same, but the real treat is how varied the world design and art styles are in Odyssey. While some people may not be able to grasp how radically different each level is, always having something new to tackle makes each location a pure joy to visit. Each area also brings about specific enemies, which means more transformations for Mario and Cappy to use. Mario games have never struggled to feature different foes, but Odyssey doesn’t retread the same ground as past titles. That doesn’t mean the nostalgia isn’t strong with this game. Nintendo has always been great at paying homage to their past, but Odyssey fully embraces the roots it came from. Not only are there references to the very beginning of Mario and Donkey Kong, but there are a ton of subtle (and not so subtle) nods, both visually and audibly, to Mario 64 and even Super Mario World. Odyssey feels like a grand celebration of everything Mario and it fills my heart with joy. What is also joyful is how Mario controls. There is a momentum to the way Mario turns and jumps that makes more sense than simply pressing a direction and having him immediately react. You need to plan your movements in accordance to how long it will take Mario to turn, so challenges all reflect the reaction time required to make twists and turns. Mario also retains all of his abilities from Super Mario 64, so you’ll have the backflip, side jump, long jump and the dive coupled with brand new abilities like a roll and hat throw. It gives players ultimate freedom in how they traverse each stage. Nintendo may have plotted a specific course for certain challenges, but Mario’s skillset is so open to interpretation that I’m sure we’ll be seeing speedruns with totally wild techniques in short order. Having basically mastered Mario 64 over the years, I was even able to pull off some wild stuff with the fluidity that Mario has. All of this would be great even without the visual flair Nintendo loves to embolden their titles with, but Odyssey has charm to spare. Small things like Mario fanning himself while in the desert or doing a little dance while listening to a jazz band bring this world to life. 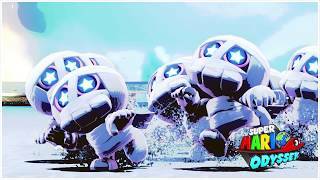 Enemies will scurry in fear after Mario transforms into their comrades and the way Mario’s head tilts when passing by points of interest makes it feel like he truly inhabits the game space. It all works to draw the player into Odyssey in small, but impactful ways. That being said, the presentation isn’t always on point. The Switch is not a powerhouse of a console, so even in docked mode, you will encounter draw distance pop-in. Running around in the appropriately empty desert will see some buildings and character models spring from thin air in the distance, which is certainly distracting. Some particle effects like snow and water can also be incredibly low in detail, which is odd paired with the superbly animated Mario and generally top notch textures. Playing in portable mode sort of hides this, but the game is also fuzzier as a result. At least the framerate targets 60 FPS and maintains it for the majority of the time. You will encounter various dips for microseconds, but Nintendo rightfully emphasized playability over graphical prowess and it helps make the game feel great. That fluidity will become a godsend to anyone who dares to tackle the later game challenges. While I wouldn’t call Odyssey a breeze, it doesn’t become truly difficult until you’re past the final boss fight and into the bonus worlds. The removal of Mario’s life count might appear to be dumbing down the difficulty, but you’ll be grateful when you’re repeating challenges without checkpoints. The only disappointing aspect of Super Mario Odyssey is the co-op mode. It can be fun and at least offers something slightly different from the main game, but fighting another player for control of the camera can be frustrating during tricky platforming sections. Having Cappy removed from your main moveset is also tough to deal with, especially after becoming so acquainted with him. The game does allow you to use a Pro-controller and a single joy-con, but this mode kind of feels like an afterthought. Even with that one shortcoming, Super Mario Odyssey is a pure treat. It evokes a lot of the same wonder that Super Mario 64 did all those years ago while bringing the typical Nintendo polish that we’ve come to expect. Odyssey may not reinvent the wheel, but it certainly perfects it. Can look quite excellent at times, but pop-in and occasional frame drops kind of hinder the presentation. At least Mario’s wonderful animations and Nintendo’s attention to detail make the world feel alive. Odyssey shows Nintendo in top form with pleasant worlds, varied gameplay and immense freedom. Mario controls like a dream and the story moves briskly, never overstaying its welcome. There’s an obscene amount of power moons and lots of hidden challenges, so players will be in for a lengthy adventure. If you want to just finish the main story, though, you’ll still find an engaging and well-paced adventure. A limited co-op mode that sees the control split between Mario and his cap companion. While not meant to be a throwaway feature, I wouldn’t call this a main draw for players. There are brief moments of slowdown, but they only last for microseconds. Nothing ever crops up in the heat of battle or platforming, so it’s easy to forgive slight errors. Super Mario Odyssey may not reinvent the Mario formula, but it is a supremely satisfying adventure with a plethora of content and a penchant for the zany. This is a must own for Switch owners and fans of platforming.